Carambola, also known as starfruit, is the fruit of Averrhoa carambola, a species of tree native to the Philippines, Indonesia, Malaysia, India, Bangladesh and Sri Lanka. The fruit is popular throughout Southeast Asia, the South Pacific and parts of East Asia. The tree is also cultivated throughout non-indigenous tropical areas, such as in Latin America, the Caribbean, and the southern United States. The fruit has distinctive ridges running down its sides (usually five, but can sometimes vary); in cross-section, it resembles a star, hence its name. The entire fruit is edible and is usually eaten out of hand. They may also be used in cooking, and can be made into relishes, preserves, and juice drinks. It is believed that it may have originated from Sri Lanka or Moluccas, Indonesia; but has been cultivated in the Indian Subcontinent and Southeast Asia for hundreds of years. They remain a local favorite in those areas but have also recently gained popularity in parts of East Asia and Queensland, Australia; as well as in the Pacific Islands, particularly Tahiti, New Caledonia, Papua New Guinea, Hawaii, and Guam. They are cultivated commercially in India, Southeast Asia, southern China, Taiwan, and Florida. They are also grown in Nicaragua, Costa Rica, Panama, Colombia, Ecuador, Peru, Brazil, Jamaica, Haiti, the Dominican Republic, Puerto Rico, Trinidad, Mexico, Guyana and parts of Africa. The entire fruit is edible, including the slightly waxy skin. The flesh is crunchy, firm, and extremely juicy. It does not contain fibers and has a texture similar in consistency to that of grapes. Carambolas are best consumed shortly after they ripen, when they are yellow with a light shade of green or just after all traces of green have disappeared. They will also have brown ridges at the edges and feel firm. Fruits picked while still slightly green will turn yellow in storage at room temperature, but will not increase in sugar content. Overripe carambola will be yellow with brown spots and can become blander in taste and soggier in consistency. Ripe sweet type carambolas are sweet without being overwhelming as they rarely have more than 4% sugar content. They have a tart, sour undertone, and an oxalic acid odor. The taste is difficult to compare, but it has been likened to a mix of apple, pear, grape, and citrus family fruits. Unripe starfruits are firmer and sour, and taste like green apples. Ripe carambolas may also be used in cooking. In Southeast Asia, they are usually stewed in cloves and sugar, sometimes with apples. In China, they are cooked with fish. 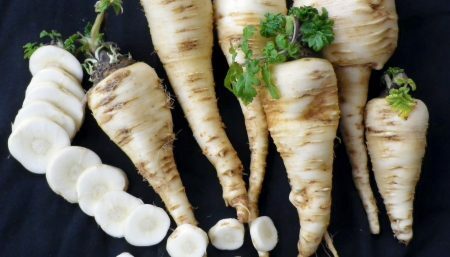 In Australia, they may be cooked as a vegetable, pickled, or made into jams. In Jamaica they are sometimes dried. Carambola is rich in antioxidants, potassium, and vitamin C; and low in sugar, sodium, and acid. It is also a potent source of both primary and secondary polyphenolic antioxidants. 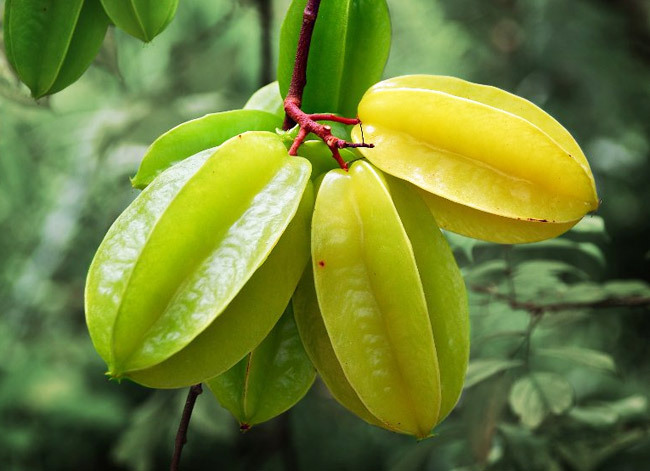 Averrhoa carambola has both antioxidant and antimicrobial activities. Scavenging of nitric oxide (NO) by the fruit extract is dependent on concentration and stage of ripening. Extracts showed antimicrobial activity against E. coli, Klebsiella spp., Staphylococcus aureus, and Pseudomonas aeruginosa. Carambolas contains oxalic acid, which has been considered harmful to individuals suffering from kidney failure, kidney stones, or those under kidney dialysis treatment. Consumption by those with kidney failure can produce hiccups, vomiting, nausea, and mental confusion. Fatal outcomes have been documented in some patients. Recent research has however, identified another compound structurally similar to phenylalanine which the researchers have termed caramboxin, to be responsible for the observed effects. Like the grapefruit, carambola is considered to be a potent inhibitor of seven cytochrome P450 isoforms. These enzymes are significant in the first-pass elimination of many medicines, and, thus, the consumption of carambola or its juice in combination with certain medications can significantly increase their effective dosage within the body. Research into grapefruit juice has identified a number of common medications affected, including statins, which are commonly used to treat cardiovascular illness, and benzodiazepines (a tranquilizer family including diazepam). The trees are also grown as ornamentals for their abundant brightly colored and unusually shaped fruits, as well as for their attractive dark green leaves and their lavender to pink flowers. Like the bilimbi, the juice of the more acidic sour types can be used to clean rusty or tarnished metal (especially brass) as well as bleach rust stains from cloth. They may also be used as a mordant in dyeing. 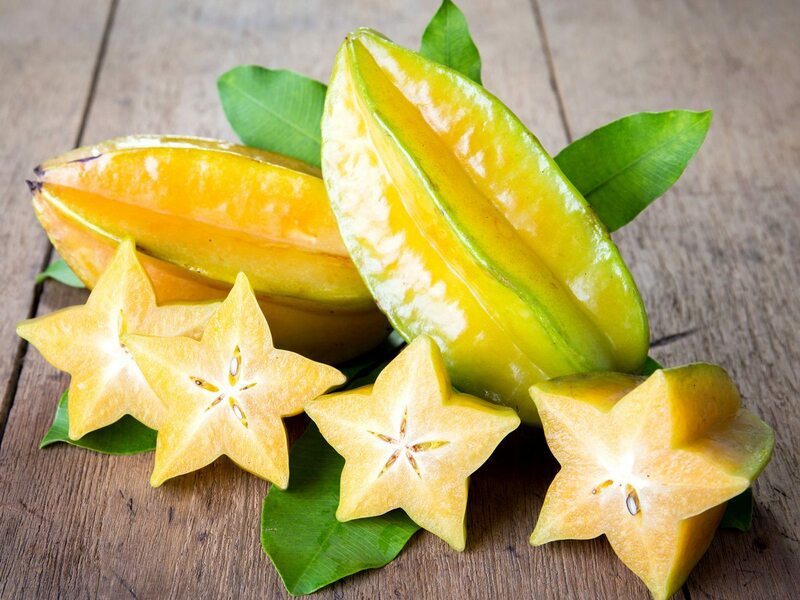 As a source of vitamins, especially vitamin A and C, starfruit effective as an antioxidant in the fight against free radicals. The fruit is also able to help prevent the spread of cancer cells, increase endurance and prevent canker sores. Star fruit provides small amounts of vitamin A and folate, but it is an especially good source of vitamin C. Every serving of raw star fruit contains 22.7 milligrams of vitamin C, an amount that fulfills 20 percent of the RDA of the vitamin. Individuals who regularly eat enough vitamin C may be less likely to develop cardiovascular disease, osteoarthritis, cancer and age-related macular degeneration because vitamin C inhibits the ability of free radical compounds to damage DNA. The vitamin C content in star fruit degrades rapidly when the fruit is exposed to heat, air or light. To maximize nutrition, eat star fruit within three to four days of purchase. Starfruit contains pectin that is able to bind cholesterol and bile acids contained preformance intestines and helps expenditures. In addition, this fruit can also reduce levels of bad cholesterol in the body. High fiber content, making starfruit useful to improve digestion. Star fruit contains insoluble dietary fiber. Insoluble dietary fiber plays an important role in keeping the digestive system and lowers blood cholesterol. High levels of potassium and low sodium, also suitable as a hypertension drug. For those who are overweight, starfruit good choice because it contains low calories. A 1/2-cup serving of star fruit provides approximately 4 percent of the U.S. Department of Agriculture’s recommended daily allowance of dietary fiber for healthy adult men and women following a 2,000-calorie diet. Star fruit contains primarily soluble fiber, a type of fiber that swells with water and forms a viscous mass in the digestive tract. Diets with a high intake of soluble fiber may help prevent diabetes and high cholesterol. According to 2009 article published in “Nutrition Reviews,” eating plenty of dietary fiber may also help prevent high blood pressure, stroke, obesity and gastrointestinal disorders. Flowers have a sweet starfruit As with antipyretic and expectorant properties. Flowers sweet starfruit can be used for treating coughs in children. starfruit tree roots can also be used for headaches and joint pain (arthritis). If there is a star fruit in the market, do not hesitate to buy. Star fruit contains an antimicrobial agent against certain types of diseases such as microbial Bacillus cereus, E. coli, Salmonella typhi and Staphylococcus aureus. Star fruit contains vitamin B, especially vitamin B5 (pantotenik acid) that help lower cholesterol in the blood, and vitamin B9 (folic acid), which helps reduce the risk of heart disease and stroke. A 1/2-cup serving of raw star fruit supplies 5 percent of the RDA of potassium and 3 percent of the RDA of magnesium. In addition to being a mineral essential for bone health, potassium is an electrolyte required by the body for cardiac, smooth and skeletal muscle contraction. A diet low in potassium-rich foods like star fruit may increase the risk of osteoporosis, stroke and hypertension. Magnesium contributes to the strength of bones and teeth and helps regulate the amount of potassium in the body. Adequate magnesium intake is linked to a lower risk of heart problems, depression and diabetes. According to the University of Maryland Medical Center, vitamin B-6 promotes magnesium absorption. If you’re concerned about your magnesium intake, include foods rich in vitamin B-6 along with star fruit in your diet. Spinach, carrots, fish, poultry and whole grains are all good vitamin B-6 sources. In 2006, researchers at the National University of Singapore extracted and studied the antioxidant polyphenol compounds in star fruit. The scientists found that the total oxidizing activity, or TAA, of star fruit was 510 micromoles per gram, making the fruit an excellent source of antioxidants. Their research determined that star fruit contains a particularly high concentration of the proanythocyanidin compound epicatechin. Epicatechin is also found in red wine, dark chocolate and green tea. Studies of the Kuna Indians living on the San Blas Islands of Panama indicate that high epicatechin intake may significantly decrease the risk of cancer, diabetes, stroke and cardiovascular disease. The Kuna Indians regularly consume an epicatechin-rich cocoa drink and have a low incidence of these health problems.